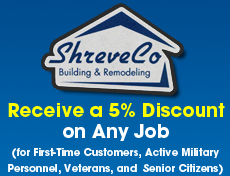 ShreveCo Building & Remodeling offers all your General Contractor needs; Roofing Contractor; Bathroom Remodeling; Kitchen Remodeling; Siding Contractor and Full Service Home Improvement and Building Needs. You envision it, we create it! Turn you house into your dream home with our expert home remodeling and repair services at ShreveCo building & remodeling from central Pennsylvania. With over 75 years combined experience, our team provides one of the finest full-service building, restoration and installation services to ensure you love your results. For any size project you are considering, bring us your home improvement plans and ideas and we will turn your dreams into reality. ShreveCo Building & Remodeling has earned the services industry’s coveted Angie’s List Super Service Award, reflecting an exemplary year of service to members of the local services marketplace and consumer review site in 2014 and previously is 2013.